Get paid $9 for each 20-minute individual class and $20 for each 40-minute group class. Enjoy flexibility. Teach from anywhere there is an Internet connection. Ditch the lesson plans and grading. We provide all that for you. We communicate with the parents and schools so you can concentrate on your online classes. Become a GeoVisions online teacher and work from anywhere. Commute to the kitchen for another cup a joe! Park in front of your desktop or laptop as your class in China materializes before your eyes. Your wardrobe? Yoga pants if you prefer. We are seeking passionate educators to teach English online to thousands of students in China – with the flexibility to teach from anywhere. Earn competitive pay teaching classes that range from 20 minutes to 40 minutes. Online teachers enjoy flexibility with no commute and no minimum hours. Moreover, the entire curriculum and online platform are provided. The more you teach, the more you make. Teachers have complete flexibility over their schedule and can select their availability. Helpful Hint: If you can keep a consistent schedule, so your students know when to expect you, you will earn more money and those students will also schedule private classes with you also, adding to your takehome pay. Group classes with public schools in China during the week are available to teach from 8 am to 12 pm Beijing time. That's from 7 pm to 11 pm Eastern, 4 pm to 7 pm Pacific. One-on-one classes during the week are available to teach from 6 pm to 9 pm Beijing time. That's 5 am to 8 am Eastern, and 2 am to 5 am Pacific. If you want more classes to teach, they are available on the weekends. Teach 25-minute fully immersive lessons for 1-3 students. Teach 40-minute lessons for large group class. Build a virtual class environment conducive to learning. Lead students through successful online course completion. The curriculum is provided to you in advance. Promote creativity and excitement in the virtual learning environment. Prioritize student needs so that each child may reach their fullest potential. Create strategies to engage and nurture student learning and student relationships. It is essential to have a consistent schedule so students and classrooms can rely on you and continue to book you as their teacher. We ask that you commit to a minimum of 6 months. Earn a competitive salary of $9-$20/class. Classes range from 25-minutes ($9) for 1 to 3 students in a class to 40-minutes ($20) for class sizes of 4+ students. If you schedule 10, 25-minute classes per week (and weekend) and 15, 40-minute classes per week, you could earn about $435 per week or $11,000 for six months. You are paid on a US 1099 form. No taxes are taken out. You are paid in US Dollars by direct deposit to your checking account on the 10th to 15th of each month. We have job openings now. If you have a Bachelor's Degree in Education or English or any other subject with teaching experience, you are ready to start. If you have a Bachelor's degree without teaching experience, you will need to enroll in an online 120-hour TESOL or TEFL course. If you are a non-degree holder, it is possible to teach online with teaching experience and a 120-hour TEFL or TESOL certificate. Already have a TEFL or TESOL? You're good to go. Native-English speaker from the United States, Canada, UK, Australia, New Zealand. Commit to being on time for all classes. Infrastructure to work from home using a desktop or laptop with a high-speed Internet connection and high-quality audio/video. Detail-oriented, organized, punctual and flexible. Device: desktop, laptop. Many tablets will also work well. Browser: Google Chrome Version 51 or above. Headset: Use a headset with a microphone, stable output, and input. Camera: HD External camera or HD integrated camera (Most laptops already have a built-in camera as do tablets. Operating System Minimum: Windows 7, Windows 8, Windows 10, MAC OS 10.8x. Memory: At least 4GB RAM. Network: An Internet connection - at least 20 Mbps. As an independent contractor, your payment or “service fee” is calculated on a per-class basis (scheduled in 20-40 minute slots.) You are responsible for your taxes in accordance with your individual tax jurisdiction or state laws. GeoVisions online teachers are paid through direct bank deposits between the 10th and 15th of each month. Although you are teaching students in China, you are paid in US Dollars. Earn a competitive salary of $9-$20/class. Classes range from 20-25 minutes ($9) for 1 to 3 students in a class to 40-50 minutes ($20) for class sizes of 4+ students. If you schedule 10, 20-minute classes per week and 15, 40-minute classes per week, you could earn about $435 per week or $11,000 for six months. There is a real need for online English teachers here at GeoVisions. You can help, and we'll reward you. We want to bring quality online teachers to GeoVisions. 2 successful teachers: $65 for each person. 3-6 successful teachers: $80 each person. 7-10 successful teachers: $100 each person. Remember, a successful teacher is someone who applies, is accepted, and then has a full month of classes. You will receive your reward with your monthly salary direct deposit. There is a $50 application fee, which will be returned to you in your first paycheck. There are quite a few applicants each week, and it takes a great deal of time to put all of your materials into a nice packet and get that information to China, where the online teachers are hired. We also developed an online course to help you prepare for and teach your demo class. We are asked the same questions each day, so we hope this page of Frequently Asked Questions will be helpful to you. Anyone in our office can answer your questions anytime you call. We want you to make informed decisions, and we will be happy to talk to you anytime. Do I need to teach for an entire semester or year? We recommend that you commit to an initial time frame of six months. Remember, it can take up to a month to become known to students, parents, and schools. Take that initial time and build up your classes, which will add to your flexibility in scheduling. Will I still get paid for the session if the student does not show up? If the student cancels two hours or less before the scheduled appointment, yes, you will still get paid. How many classes can I teach each week? That’s up to you. How much money do you want to earn? :-). To begin, it will be fewer classes as students and classroom teachers in China start to “meet” you through your tutoring. Then as they get to know you and your teaching, they will select to sign up with you. What's the process once I sign up? Read our online course on how to be a great online teacher. 4 lessons and the entire course is free. This will also be excellent preparation for your demo class. Now teach a 20-minute demo class, using our own platform and curriculum. The online class will show you the way. If you don't already have your TEFL or TESOL certificate, sign up for your first class. Begin scheduling your online classes using our scheduling software. This process should take approximately 2-3 weeks. Yes, there is a 2-3 hour online orientation. And, we pay for your attendance. What hours are the lessons? Moreover, don't forget the weekends if you want more classes to teach. We recommend being available for more time slots than you want to begin. There is an online scheduling platform for teachers to use. Do I need to have a Bachelor's Degree to teach English online? Online teachers with at least a Bachelor's degree will get booked faster than online teachers who don't have a degree. Over the years we have met plenty of non-degree holders who become amazing teachers. You will need to take our 120-hour TESOL course to qualify. Also, you will need to teach a demo lesson. If you pass both, there is no reason that non-degree holders can't teach English online. We provide the curriculum. You will need to become familiar with the curriculum before your classes begin. Just follow it, which will guarantee your success and the success of your students. 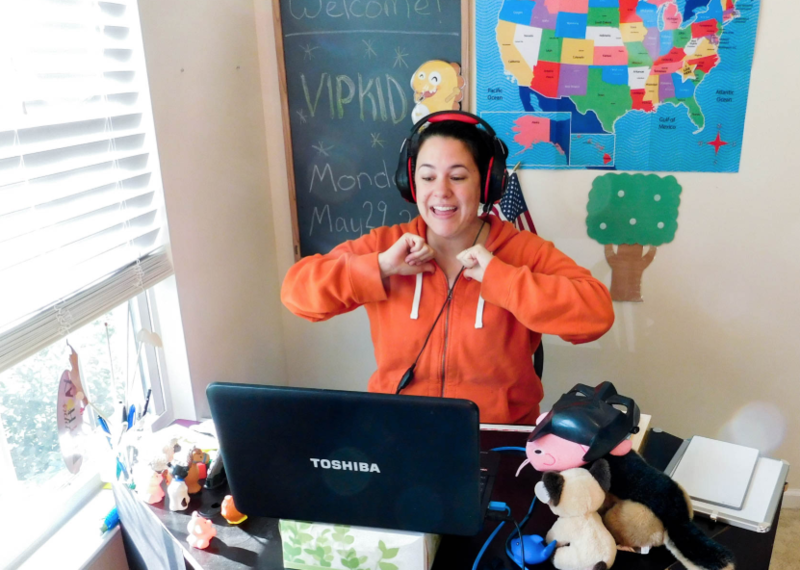 Here are a handful of photos to give you a sense of what it's like to teach online with GeoVisions Foundation. You can also find more photos, stories, and video about the GeoVisions Foundation through our Facebook Page, Instagram and YouTube channels and our Blog. A GeoVisions teacher and his student learning English online. A GeoVisions teacher teaching an online group class in English. A GeoVisions online teacher celebrating her student understanding an English grammar concept. A Geovisions online teacher in the middle of one of her classes. You can live anywhere and be an online English teacher with GeoVisions. Location is not an issue. 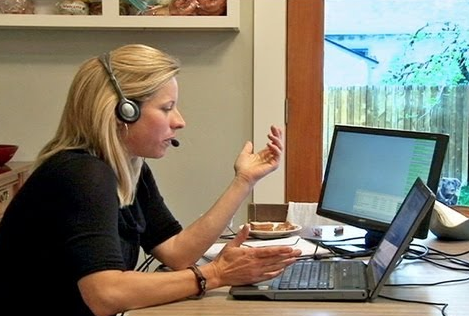 A split screen on a GeoVisions online English teacher and her student.